If you've read any posts on the blog before, you'll know what a broken record I am when it comes to how I like my skin to look. My skin is quite dry, dehydrated, and dull naturally, so anything I can do to add a glow, I'm in. 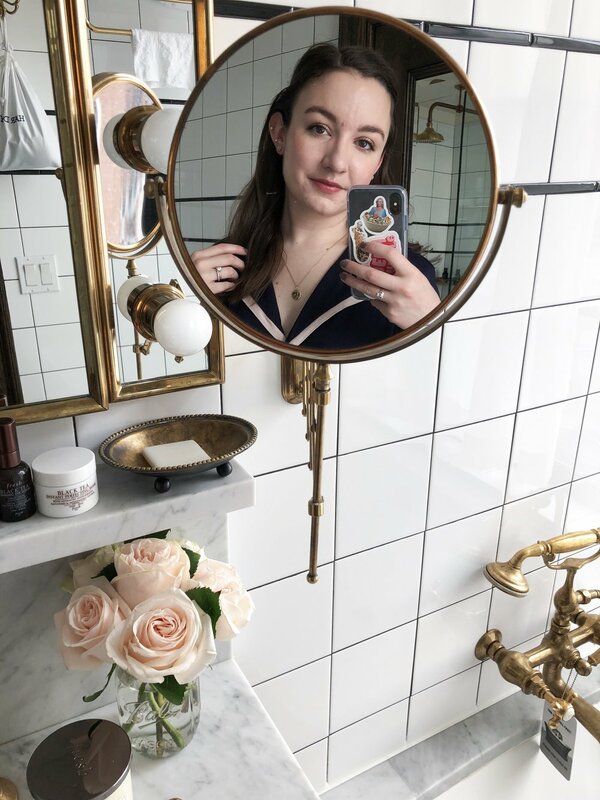 Lately I've been taking extra care to really prep my skin to make it look its best when it comes time for makeup, and today I'm rounding up some of my favorite products to get that super luminous, dewy base. Prepping the skin for makeup is probably the most important step here. A painter wouldn't paint a masterpiece without properly preparing their canvas, so why should you apply your makeup without preparing your skin first? When I have time in the morning or for a special occasion, I love using the Tata Harper Resurfacing Mask as a pre-makeup step. It has instant results, giving you that just-got-a-facial glow. It gently exfoliates the skin, leaving it super smooth but never red or irritated. Because of my skin type, I love loading up on moisturizers before makeup to ensure my base goes on as smoothly as possible - you would think this would decrease a foundation's longevity, but it actually helps keep my skin from drinking up the foundation, making it last longer. My favorite moisturizers for underneath makeup are both from Glossier - the original Priming Moisturizer and the Priming Moisturizer Rich. I've been using the Rich version all winter to help with my dry skin, but the lighter original version is my go-to in the warmer months. Right now I've actually been loving using both - the Rich version has a bit more of a velvety finish on my skin, so I apply that all over and then apply the original, which has a dewier finish, on the high points of my face. Another way to make skin really glow is to apply a facial oil underneath your makeup - Rosehip Oil is my favorite, as it's lightweight and sinks in quickly. As a finishing touch, a face mist is perfect - it locks everything in and helps amp up that glow. I've been using the Pixi Glow Mist* a lot since I received it last week, and it's already becoming a staple in my routine. Once your skin is all prepped and primed, picking the right base product is next. I usually go for really lightweight, glowy bases, like the Glossier Perfecting Skin Tint, for a natural, glossy-skin look. When I want slightly higher coverage I've fallen back in love with the Charlotte Tilbury Light Wonder Foundation - it's the glowiest, most beautiful foundation ever and will give you Victoria's-Secret-model skin. On special occasions when I want my makeup to last a long time, or if I just need even more coverage, my holy grail is the Giorgio Armani Luminous Silk Foundation. This really is worth all the hype it gets - it's absolutely stunning on the skin. To make it a little less "makeup-y" looking for everyday, it is beautiful when mixed with the Glossier Skin Tint. Concealer is also important - I like using a light layer of foundation all over and then going in with concealer where I need more coverage, rather than wearing full coverage all over my face. The NARS Soft Matte Complete Concealer is still my number one at the moment, and despite having "matte" in the name, it really lends itself well to this look. It isn't overly matte on me, but rather has more of a skinlike finish. The areas of redness that I usually need to conceal tend to be in oilier areas of my face as well, so something more matte is perfect. A 2-in-1 product like the Wander Beauty Dualist Matte and Illuminating Concealer* is perfect, too - one end is a matte stick concealer, while the other is a brightening, illuminating concealer. It's so convenient to have both products in one, so you're covered whenever. You can't talk about luminous skin without mentioning highlighters, right? I think creams work best for this look, as they're usually more toned down and mesh well with the skin, making it look like you're just glowing from within. I can't go a minute without proclaiming my love for the Glossier Haloscope in Quartz - it's just the best in my opinion. It adds just the perfect amount of dewiness to the skin, but can still look quite intensely glowy. If you're looking for something with no shimmer whatsoever, take a look at the new Ciate London Dewy Stix. This is literally just a skin gloss/balm in a stick. It adds a glossy sheen to the skin that looks like you've been eating right and sleeping well your entire life. I prefer to dab it on with my fingers rather than striping it on straight from the tube, and it looks beautiful dabbed on the eyelids as well. Adding a bit of a flush to the skin is important, too - it adds to the healthy look we've been building here. My favorite is the Glossier Cloud Paints* - they're the most natural-looking blushes I've tried. They blend effortlessly into the skin and look just like a natural flush. My favorites for my skin tone are Puff and Dusk, especially mixed - they make the perfect neutral pink. If you haven't tried at least one of these yet, you need to. What are your necessities for a glowing skin look? I mentioned a lot of Glossier products in this post, and you can get 20% off your first Glossier order here. I do make a small commission on orders placed through my rep page, but all that money earned gets invested back into this space on equipment and products to review!